Mumba Devi temple, situated in Zaveri Bazar of South Mumbai, is the oldest shrine of Mumbai. Built in the honor of Mumba Devi (guardian of the Koli fisherman community) is the reincarnation of goddess ‘shakti’. 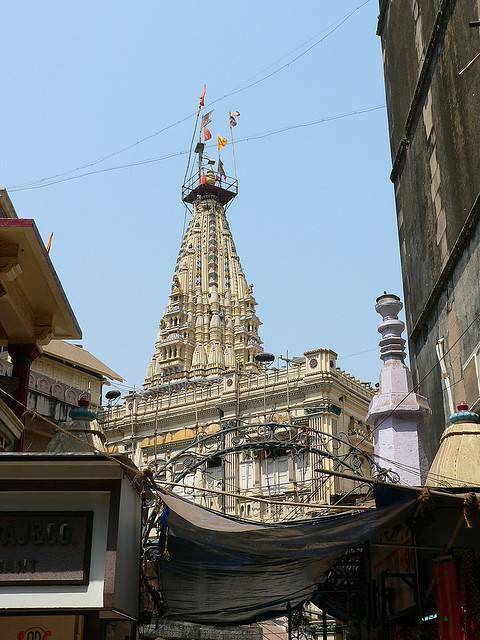 Built in 18th century, this temple stands today amidst the crowded markets of Mumbai. Legend has it that Mumba Devi appeared out Brahma, to emancipate the locals from the terror of a demon, Mumbarka, who was later condoned after building the iconic temple. Apart from the devotees, tourists throng the temple, for its architectural beauty and the idol of the deity bejeweled a silver crown, golden necklace and nose pin, placed on an altar adorned with marigold. The narrow lanes leading to the temple are full of sweet shops, flower shops and jewelery stores.